We can achieve fully 4terminal sensing for build-up board by the VBPC. 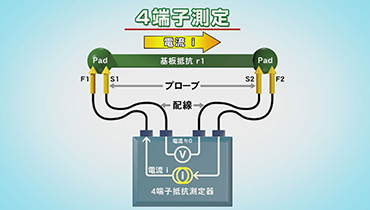 By using 4terminal, apply voltage and measure current at the same time. Therefore we can measure resistance more accurately. The VBPC can correspond to the high density fully matrixed 100µm narrow pitch packaging board. Probe replacement are easy because this structure is simple. The VBPC can correspond to the high density fully matrixed 100µm narrow pitch packaging board. We can provide many kind of test fixture which suitable for each testers. The customer who did not sutisfy about the cost of specific test fixture for experimental board and small lot. Please feel free to contact us. Probe replacement are easy because this structure is simple.